Many of you may remember back in October 2013 a giant oarfish was spotted just off of a beach on Catalina Island, California. Despite being one of the largest fish in the sea, giant oarfish remain one of the most elusive. And so when one finds its way to shore, it’s not only a spectacle for its size—this one was 18 feet!—but also a very unique find. It can often take hundreds or thousands of individuals of a species to simply begin to understand basic biology (age, growth, reproduction, etc), and while only so much can be concluded from an individual, a single oarfish represents a substantial opportunity to collect information. Shortly after its discovery, scientists arrived to sample tissues—stomach, gonads, muscle, etc. And some of the information was quickly beginning to shine a light on the biology of oarfish, or at least this particular individual. And not too long after the fish’s discovery, I found my way on a flight to LA, followed by two boat rides, all in an effort to try and be the first to remove the otolith (earbone) from this sea monster. 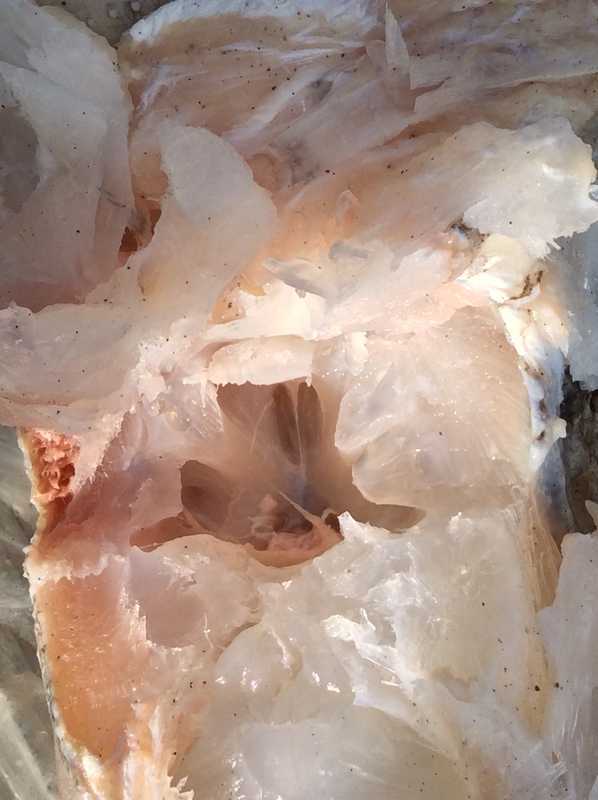 Fish otoliths are a repository of information; we’ve covered otolith science here, and here, and here. 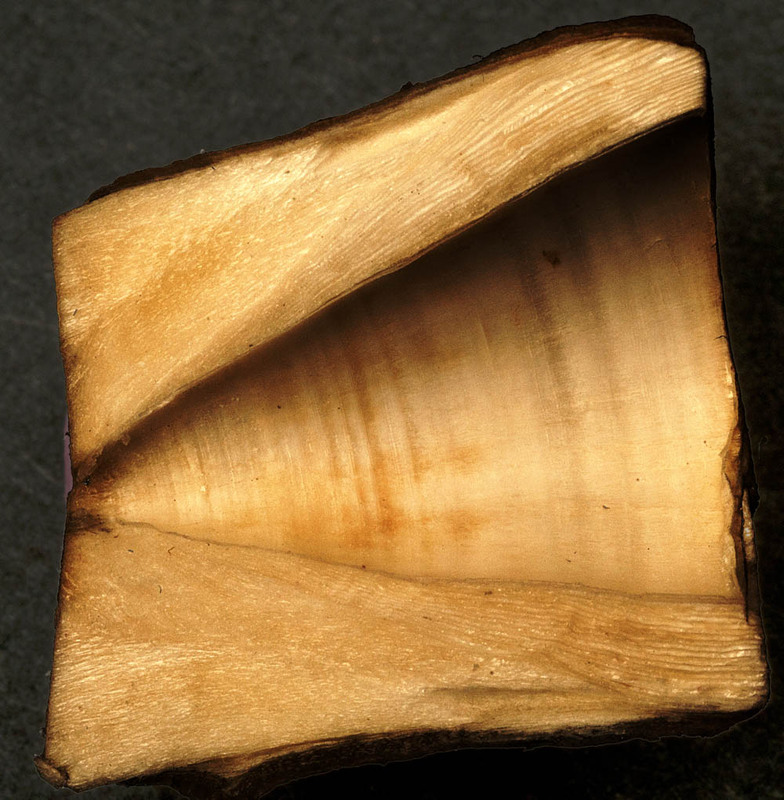 Primarily, the often tell a fish’s age because they accrue rings in the same way a tree does. 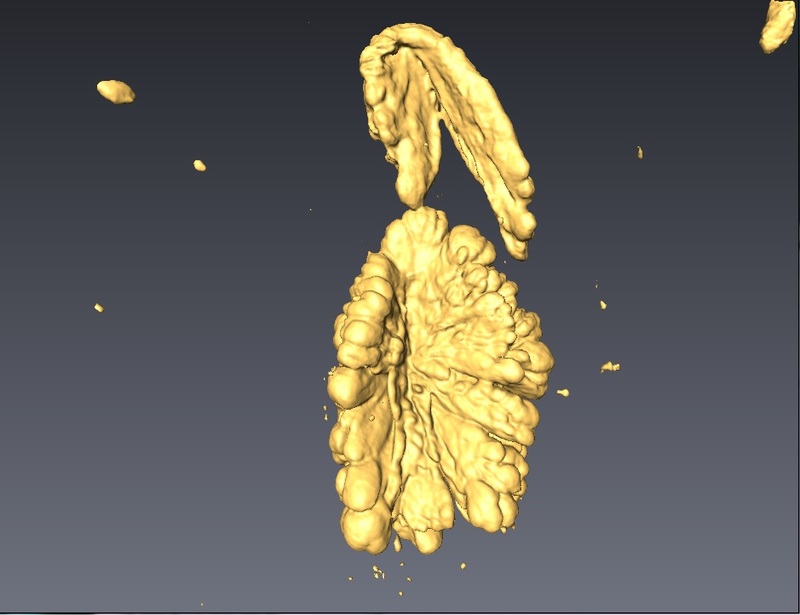 But for some reason, the otoliths of giant oarfish are not particularly easy to extract, as I was unable to track down any person or work successfully documenting the process. With NOAA fishery biologist Bev Macewicz, we let the oarfish head defrost in the warm November sun (the fish had been sectioned and kept frozen over the few weeks since its discovery). But it quickly thawed, and surrounded by a mounting army of bumblebees, I began slicing back the skull as I might do for most fish. The skull was largely cartilaginous—not bone—so it sliced fairly easily. We found the brain, and suspected the otolith would be situated just below it, as it is in many species. We sliced gently. And we gently sliced some more. Fast-forward about an hour and finally, amidst shards of cartilage and bits of various other tissues, my forceps felt something small and bony—an object with promising features. But it was very small. Much smaller than I anticipated. When it was finally removed and in my hand, I had to scratch my head. Why would the otolith of an 18 foot fish be smaller than some otoliths I’ve seen from 6 inch fish? It need not scale entirely with size, but this was one of the smallest otoliths I had ever seen—of any species! Regardless, we safely stored it and took a few other bone samples for age—namely a vertebrae and some fin spines, which may also form annual rings for aging purposes. 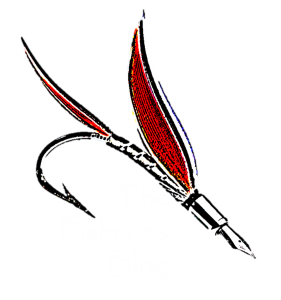 Next Post IUU fishing: Should we consider Illegal, Unreported, and Unregulated fishing together? Enjoyed the story. I have no experience counting rings, 38? I will guess 23 due to the visible bands. I zoomed in on the image a bit, likely blurring the banding patterns. Also no experience with ageing via vertebrae. Can’t wait to read the study, I’m very interested in the results you found from the otolith! I, too, counted 23 rings. You asked why they might be so small? Just wondering if there are other species where this is also the case? Makes me wonder if either they don’t have a significant need to know direction and nature of sounds (e.g., their world is generally very “quiet” and they don’t have to track their food) or perhaps it might create a lot of “noise” and some other sense predominates. Wow amazing. I never knew there was one of these in California. Great documentation with photos of the whole process.